This is a 5 day overview to the art of teaching trapeze and aerial fabric, with a focus on spotting techniques, injury prevention, psychology of teaching, basic rigging concepts and class management. This in depth and holistic approach to teaching is appropriate for new teachers and those with experience, and for those who work with youth or adults in a variety of educational environments including circus schools, gymnastics programs, summer camps, fitness studios and more. This workshop is required for application to the Nimble Arts™ Certification Course, a multi level program guiding participants to become safe and capable circus arts teachers for both the hearts and bodies of their students. Pre requisite: All students are expected to prepare by successfully completing the elements in the required Nimble Arts™ DVD: Aerial fabric: Beginning Level 1 prior to the start of the workshop. Trapeze experience is not necessary but it will make your journey easier. All participants will be required to read the terms and conditions available on booking from Gravity & Levity in advance and sign on the day of registration. 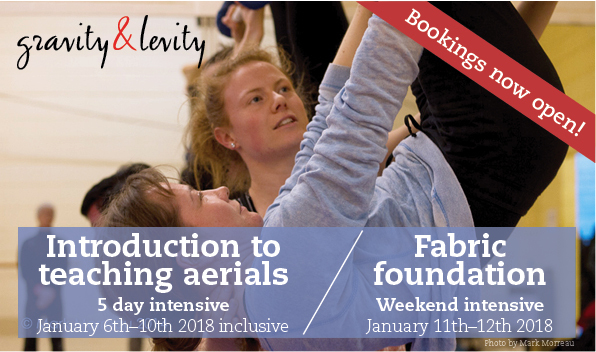 This course will guide you though the curriculum created by Nimble Arts™ to provide clear and effective progressions and spotting techniques for beginner and continuing aerial fabric students. Working with skills that can be executed close to the ground focus is on body awareness, fabric placement, spotting techniques and meeting the conditioning needs of novice and beginner students. Required materials: You must purchase the DVD Aerial Fabric: Beginning Level 2 in advance of the course. It can be purchased from Nimble Arts or Firetoys. If both courses are booked together then a reduction of £100 will be applied = £725 for the 2 courses. On booking a non-refundable deposit of £300 for the Introductory 5 day course and £125 for the fabric foundation weekend long course is required or £400 for the 2 course offer. The remainder of the cost is payable before Dec 4th. Your place will not be confirmed on the course until your deposit has been received. Lindsey Butcher: Since graduating from London Contemporary in 1984 Lindsey has worked with numerous dance, theatre & opera companies as a dancer, aerialist, teacher, mentor & choreographer. As a dance & aerial practitioner she has over 30 years of professional practise & has been creating vertical-dance for almost 20 years. In 2003, (after winning the JerwoodAward for Circus) Lindsey founded the aerial dance company, Gravity & Levity (G&L) to provide a vehicle for her artistic vision. Under Lindsey’s direction, G&L have created 3 full length touring aerial dance productions, an outdoor piece and several site-specific commissions and won the Dance for Camera award. Copyright © 2017 Gravity & Levity, All rights reserved.